Donington, 22 May 2015 – An atypical Friday, with three timed sessions, kicked off the English World Superbike weekend. 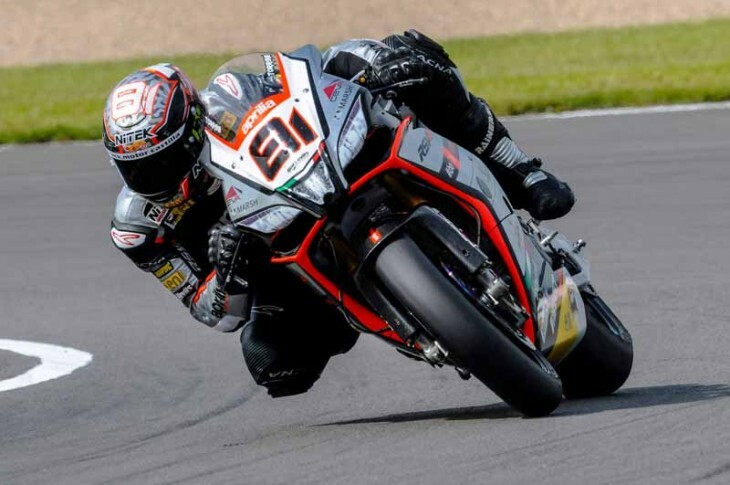 At Donington the first timed results leave little open to interpretation: with 13 riders all within one second of one another, we can reasonably expect some tight competition tomorrow and Sunday. The first question in the team Aprilia Racing – Red Devils garage concerned Leon Haslam’s physical condition, with rib pain after his crash at Imola. The English rider, lying second in the championship, is still suffering with pain that, according to him, will not significantly affect his performance. His confidence was confirmed with a nice fourth best time earned today at the end of the three sessions, a promising result although there is still work to be done in order to perfect performance over race distance. Leon also missed a few laps during FP2, stopping prematurely to check the condition of his number 91 RSV4 RF. The three close sessions did not help Jordi Torres who, besides trying to squeeze out the best possible performance, must also learn a track that he has never faced before. Whereas at Imola the Spanish rider used the break between Friday and Saturday to collect his thoughts and speak with his mechanics, riding to a podium finish on Sunday, here the apprenticeship must take a different path. A gap of less than 8 tenths of a second doesn’t worry Jordi, who feels that he can improve significantly in FP4 tomorrow to then place his cards on the table in Superpole.